Make an Egg Stand on End. A surface, like a worksurface or piece of wood. Spin the egg as fast as you can. Try spinning the egg starting off at different angles. When you spin the egg you nearly always spin it at a slight angle. It is virtually impossible not to. When you spin the egg you normally end up spinning it so that it is at an angle . As the egg will try to spin around its centre of mass the point that is touching will be moving across the table, so you would expect a friction force between it and the table. However you can seperate the rotation into mostly a rotation around an axis at right angles to the egg, plus a small rolling rotation around the long axis of the egg. You can think of spinning the egg at an angle (black) as spinning it mostly at right angles to the egg and a rolling motion around the long axis of the egg. The spinning egg in slow motion. This actually means that the egg is spinning like a wheel and is actually pushing the egg along, so the frictional force will be acting in the same direction as the contact point is moving pushing the egg along. 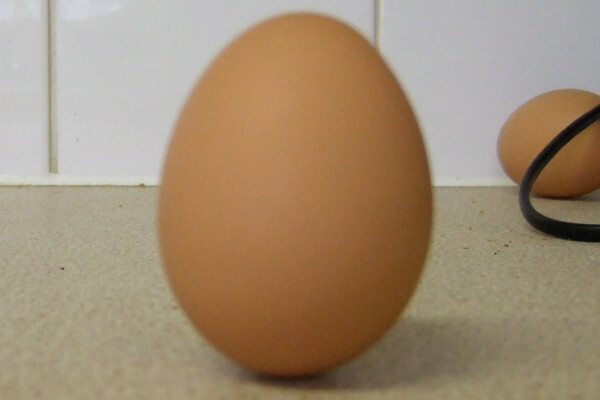 If the egg is very flat the contact point and centre of gravity are very close together so it only has to spin very slowly to work, as the egg becomes more upright more of its spin is around the long direction so it rolls faster and still acts as a wheel. This force is what is driving the change in angle of the egg. Because the egg is spinning around its centre of mass which is not above the point of contact, the contact point gets moved around the surface. View from the wide end of the egg. Normally this force would act to twist the egg and make it roll, however the egg is spinning, so the egg acts as a gyroscope. Gyroscopes have a very interesting property. If you apply a twist to a gyroscope as gravity does in this case (blue arrow) the axis of the gyroscope actually moves at right angles to this along the green arrow. If the gyroscope is standing up as in this picture this means that it will keep going around in a circle rather than falling over. This means that the friction on the egg (blue arrow) will actually cause the axis of rotation of the egg to move at right angles to this (green arrow) and start to stand upright. Eventually if the egg was spinning fast enough it will stand upright. Nature 416, 385 - 386 (2002).